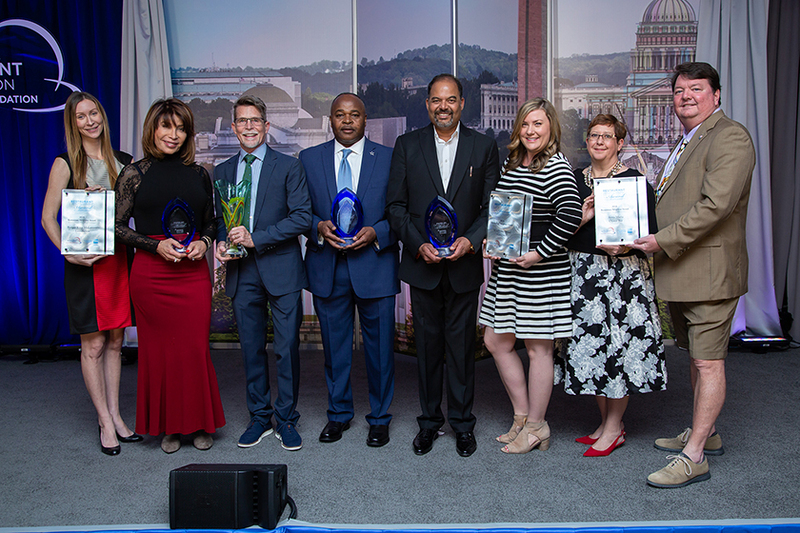 Amanda and I were so thrilled to share the honor of visiting Washington, DC to accept the National Restaurant Association Educational Foundation’s Restaurant Neighbor Award with some of our AMOB family members. Joining us were two of our Ellenton team members, Chris Whittaker and Michael Madden, both of whom went above and beyond to help facilitate the first-ever Dive Into Reading program at our Ellenton location in June 2017. My Dad, Lynn Sr., was also able to join us, which was great although we missed my Mom (who wasn’t feeling well and opted to stay home….really we think she was just taking advantage of an opportunity for peace and quiet without Dad at home!). Our permanent tag-along, our Marketing Consultant Eleni Sokos of Sokos Social traveled with us to document the fun. This was the first trip to DC for some, which was a special treat to create memories and celebrate together. You’ll hear a lot about what we ate, because Robbing & Duplicating — err, we mean, Research & Development — is always a key component of our travel adventures. We love bringing back new flavors & exciting dishes to our AMOB guests. On Monday, the group arrived in time for a quick bite before zipping off to the Capitol complex to meet our tour guide, Lewis Plush from Congressman Vern Buchanan’s office. Lewis was a gracious host and an informative guide to the history, traditions, and even secrets of our government’s legislative branch. Amanda and I being cat people, we especially loved seeing the paw prints of a long-gone cat in the floor outside the Old Supreme Court Chambers…it was also fun to hear the echo created by the half-domed ceiling in the National Statuary Hall, the former House of Representatives. We posed for a few quick pics under the Rotunda including one depicting the Spanish conquistadors landing in the New World…a special shout-out for my brother Lynn and all of our friends in the Hernando de Soto Historical Society. We watched in the viewing galleries of the House for a few minutes before bidding adieu to Lewis, whose family in Sarasota frequents Landside…thanks again to Rep. Buchanan for sharing him with us…Lewis, be sure to say hey next time you’re in the restaurant! Amanda and I attended a special National Restaurant Association reception at Del Frisco’s Double Eagle Steak House where we were soon joined by the rest of the crew for a decadent dinner. Highlights from the meal included the Broiled Lobster, Bone-In Prime Ribeye, Thick-Cut Bacon au Poivre…and we tried several potato preparations including the Uptown Del’s Potatoes with fontina, chives, and truffles… let’s just say our dinner resulted in plenty of ideas for Madden & me to test in our kitchen. It was also our pleasure to dine with our friend Anne Rollins from Gecko’s Hospitality Group, winners of last year’s Restaurant Neighbor Award, as well as a good friend from back home in Bartow, Kristin Thompson, who is a lawyer in DC. It was such a joy to see she and dad cutting up, swapping stories and memories from years gone by. After dinner, Amanda arranged for us to tour the DC Monuments & memorials by night with a wonderful tour guide who shared both facts and anecdotes about these incredibly special places. We were joined by friends from FRLA, Dan & Moriah Murphy and Kimberly & Mark Kemp (United Health Care). My personal highlight was experiencing the Korean War Monument along with my Dad, a Korean War vet who was seeing it for the first time…truly humbling and moving. Thanks, Dad, for your service. Tuesday morning, Amanda, Dad and I had the honor and privilege to tour The White House – truly remarkable to explore the halls of history where so many world leaders have once walked. We were there soon before the passing of former First Lady Barbara Bush, and were able to pose with her portrait in honor of our shared commitment to literacy. We met up with the gang who was on a street food tour…of course we found them at the beer shop sampling a selection of local brews including the official Cherry Blossom Festival beer. We were just a few days late for the annual event, but a few trees were still donning their splendid blooms for the occasion..they must have known we were coming. Our informative guide introduced us to some amazing pizza, tacos, the DC favorite “Half Smoke,” and we finished things off with some absolutely delicious pies. After waddling back to the hotel it was soon time for the main event, the NRAEF Fala where we would accept the award and its $10,000 prize sponsored by American Express. We stood in great company along with the other Restaurant Neighbor Award winners, Wildflower Bread Company, and Burger King’s McLamore Foundation. Two other awards were also presented along with the Restaurant Neighbor Award. First was the Faces of Diversity American Dream Award which honors those who have achieved success through perseverance and determination. Each year the NRAEF, in partnership with PepsiCo Foodservice, recognizes three individuals who embody the American Dream – Anil Yadav, George Wasai, and Michaela Mendelsohn. Finally, the Thad and Alice Eure Ambassador of Hospitality Award the premiere award bestowed by the NRAEF to an individual who has exemplified extraordinary achievement and leadership in the restaurant and hospitality industry, and this year was presented to Chef Rick Bayless. It was so inspiring to hear these stories and refreshing to know that across our nation so many hospitality industry leaders are working to not only better their own establishments but their communities as well. We were also thrilled to have some friends from home joining us for the Gala including Congressman Vern Buchanan, Beth Duda of the Patterson Foundation Grade Level Reading Director, as well as the grand dames of the Women’s Resource Center, Ashley Brown and Lillian Elliott. These three ladies mean so much to me to us and I’m glad that their business in Washington could be parallel with ours to celebrate together. Of course, it wouldn’t be a celebration without great food and more R&D opportunities, so we visited our very favorite oyster bar in DC, Pearl Dive Oyster Bar for a seafood feast complete with ceviche, mussels, and you KNOW we tried a variety of oysters…from different regions and with amazing sauces and in different preparations. We especially loved the bacon-wrapped Angels on Horseback oysters and the Tchoupitoulas Cajun-style oyster confit. Madden was also inspired by those dishes too, so look for something similar on a test kitchen menu soon! When we’re in DC we always have a nightcap with our friend Michael Finnerty, bartender at the DC institution, Old Ebbitt Grill. Michael and I worked at Fast Eddie’s on the Anna Maria Pier together many moons ago…his mom still lives in Bradenton and stops in to the O-Bars frequently. Great to see you, old friend. Wednesday morning found us bright and early with a fabulous brunch at Founding Farmers. Beignets, Peanut Butter Banana Toast, Chicken & Waffles, Pimento Cheese Hash… Eleni was taking notes for her favorite AMOB meal, Weekend Brunch at the Pier. As we had to meet up with the NRA for some meetings on Capitol Hill, we said farewell to our AMOB family who departed for a quick tour of Arlington and the DC monuments (by day this time) on the way to the airport. It was a beautiful day to visit the hallowed ground of Arlington and pay tribute to our nation’s fallen. This great adventure was an amazing way to share in the celebration of the NRAEF Award. But these awards are not possible without the support of a truly awesome team – ALL our staff at ALL our locations – who make things happen for our community every day in our restaurants. We are so grateful for their dedication to our mission – not only to serve great food at a great value in a fun, family environment, but also to serve our community and advance education.